These "home from home" cottages have all the benefits of modern living including heating, washing machines, fully equipped kitchens essential for the self catering holiday - all while keeping the essence of these historic homes. The village has a fish & chip shop, bakery, pub serving food and local shops. The inglenook fireplaces complete with wood burning stoves and the original cloam ovens give the quintessential cosy cottage feel. We regret we operate a no smoking policy and we are unable to take pets. Freeview Television and DVD Players can be found in both cottages together with a small CD player. Both Rock and Cistus holiday cottages have private back gardens, furnished with picnic tables and charcoal fueled Barbecues. 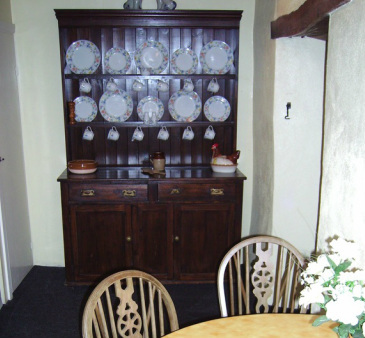 The cottages are serviced by our local Housekeeper who is on hand to make sure your stay is a comfortable as possible. All linen is provided and a welcome tray will be ready for your arrival. The cottages sleep 4 comfortably but sofa beds are available downstairs for occasional use. However for larger parties we can book both cottages together at a discounted rate. We can also provide a baby's cot, please ask at time of booking. Accommodation consists of the double master bedroom and the traditional 'cot' room, with two split level single beds. All Linen is provided and extra linen is available should you need it. Electric blankets are provided on the double bed for our intrepid winter visitors. You should find everything you require to make your stay as comfortable as possible but should you need anything, our Housekeeper will be delighted to help.